LONDON: An Asian businessman celebrates the election victory of "Richmond's son-in-law" – Prime Minister Imran Khan in Pakistan. Ashwani Kumar, 65, has placed a large banner in front of his store on Redline Street, attracting the attention of locals who notice the banner visible from afar. The big banner in front of Stitch N Fix's store reads: "Congratulations to Richmond Imran Khan's son-in-law for becoming Prime Minister of Pakistan." Ashwani Kumar runs his grocery and dry cleaning business near the home addresses of Imran Khan's former home In-laws, the Goldsmith family. 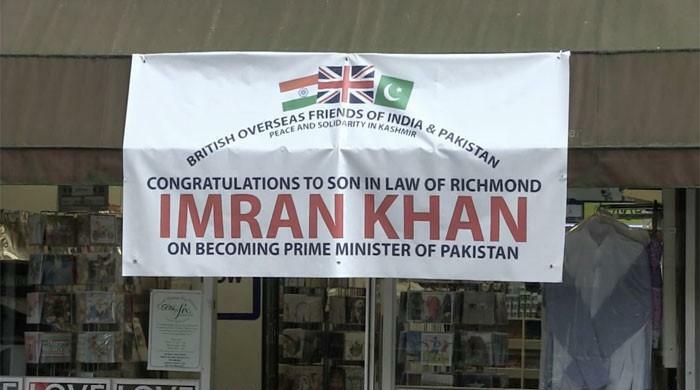 Zac Goldsmith, the local MP for Richmond Park and a friend of Ashwani Kumar, posted the image of the congratulatory banner on social media sites to support Imran Khan of the residents of Richmond. 9659002] "The goldsmith family and Imran Khan are frequent visitors to my shop, coming here to clean, remodel, etc. Jemima and Zac Goldsmith are my local customers," said the businessman, who is a group called The British Overseas Friends of India and Pakistan. Kumar claimed that Zac Goldsmith is his "brother, son" and added that his father Jimmy Goldsmith was also his friend during his lifetime. "I am Zac Goldsmith's local election campaign manager during election time, and I am very glad that I am connected to this man, Imran Khan, who visits me in Richmond and is very proud of Richmond because he is based in London remains, "said the businessman with regard to Imran Khan, who lived mainly in Annabel Goldsmith's house in Richmond when he was in London. Ashwani Kumar also sells newspapers and magazines in addition to dry cleaning and sewing. He said that Imran Khan first went to his shop in Shalwar Kameez about 15-20 years ago to buy Jang newspaper and was surprised to see him. He was surprised to buy the Jang newspaper daily. " his business has gone to ask for Richmond's "son-in-law", some drivers have honked from outside and some have eaten sweets to celebrate. Ashwani Kumar called himself "Patriot Pakistani". His parents emigrated in 1947 from Gujranwala to India. "I was born in India and came to the UK at a young age and since then I live in Richmond, but I consider myself Pakistani.My elders lived near the GT Road Gujranwala and were famous for their hospitality.I recently visited Pakistan and went to Gujranwala to visit the places where my elders lived. " Imran Khan and Jemima Goldmsith were married until 2004. Jemima Goldsmith and her children live in Richmond. Jemima's brother Zac Goldsmith is co-chair of the Conservative Friends of India (CFI). Zac Goldsmith said in a statement, "Imran has many friends in our community and as I celebrate her the decision of Pakistani voters to come back to him." It was a long struggle for him, but I never doubted that he was Prime Minister I have no doubt that he will fight the corruption that has so long thwarted and held back Pakistan. " Imran Khan had supported Zac Goldsmith at his Mayor meeting against Sadiq Khan in London.